We are thrilled to invite you to our next InterNations Event - St. Patrick's special night! 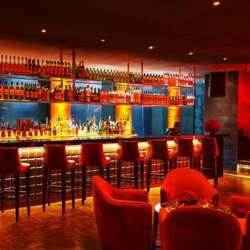 Sazerac is a cozy lounge club nestled in Sundar Nagar Market, a quiet and green neighborhood of Delhi where sophistication is a way of living. Delicious finger food, curated cocktails and spirits will be served on Sazerac charming rooftop for a night of networking, laughs and dance moves! Members will get two welcome drinks of their choice, accompanied by veg and non-veg finger food on rotation during the event, and as always there will be an optional unlimited drink package for whoever wants to avail of it. Welcome shot for all the guests following St. Patrick's theme: wear green!